Your profile picture may be a picture of yourself or an avatar image of your choice. 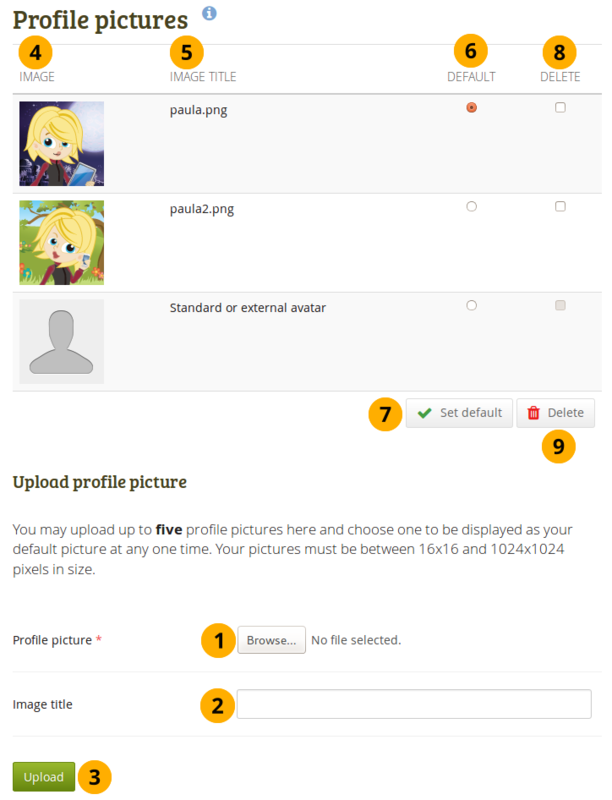 You can upload up to 5 profile pictures into Content → Profile pictures. Alternatively, you can use a Gravatar if you have one and if the site administrator allows its use. The pictures you wish to use must be between 16x16 and 1024x1024 pixels in size. Ideally, your profile pictures are square. Please use an image editing software before you upload your pictures to reduce a photo’s dimensions to the required ones. The recommended size of your profile picture is 100x100 pixels. Then the picture looks good on your profile when you want to include it there and also in the smaller sizes around Mahara. The profile pictures that you wish to upload to Mahara must be available on your computer. Choose one picture at a time to upload. You can also give it a title. Profile picture: Click the Browse button to navigate to your picture on your computer, select it and click Open. You must select an image file to upload. Image title: Optionally, you can enter a title for your picture. Click the Upload button to transfer your picture to Mahara. It is uploaded to the images folder in your Files area. Image: Your picture appears in the list of profile pictures. You see a preview of it. Image title: If you gave your profile picture a title, you see it here. Default: Decide which profile picture you wish to make your default one which others can see in the “Online users” sidebar and on your profile page. Click on the radio button next to the picture to choose it as your default picture. Click the Set default button to make your selected picture the default one. Delete: Select the picture or pictures you wish to delete from your list of profile pictures. You cannot delete the standard profile picture or your Gravatar. If you did not upload a profile picture and set it as default, this will be your default profile picture. Clik the Delete selected profile pictures button to delete your profile pictures. They will also be deleted from the images folder. If you use a profile picture in a portfolio page, e.g. chosen via the “Image” block, you do not get a warning upon deletion of the picture from the Profile pictures page. If the site administrator allowed users to display remote avatars such as a Gravatar and you have signed up to that service, your default picture will be this remote avatar until you make one of your uploaded pictures the default picture.